For the longest time I thought "creativity" was a word reserved for people who decoupage. Terrifying right? But disturbing as this paper mache pussycat might seem, I'm afraid the greater sin lies with the mind that considered it the creme de la creative in the first place. And if I thought that way, then who knows what the rest of America thinks. Actually, we all know what America thinks. All around the country, arts programs are being dissolved from public education, and our most popular television shows do little more than exploit fame hungry zombies. It seems we're just not facilitating actual "creativity" like we could or should. Creativity definition- the potential to see beyond what already is. Isn't it fascinating that we put such emphasis on learning what already is or has been proven when our wants and needs are so often attached to what has yet to exist? I mean, even if we do already have the answers, there's a reason they haven't become realities in our world. It's because creative inspiration hasn't connected the dots. One of the greatest gifts we can give to the world as well as our future generations isn't what we've already studied, but the example of a blissful relationship with what we can't. Embracing our imaginations and creativity cannot be more or less important than what we learn. Simply put, they are equal partners. As it was recently explained to me, you can't wait to see if a cake turns out before you add the eggs. Creative inspiration is out there. Sometimes it's inside of us. Sometimes it's painted, or filmed, or written. But whatever it is, creative inspiration turns on a light that can shine on everything in our lives, from making dinner to presenting in the boardroom, and in doing so, allows us to see beyond what already is. 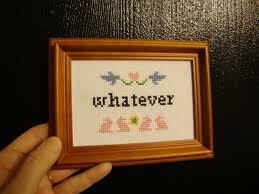 Don't shake your needle point in my face, America! I'm serious! It's time to get creative, and I think it's possible in more ways than we can count. 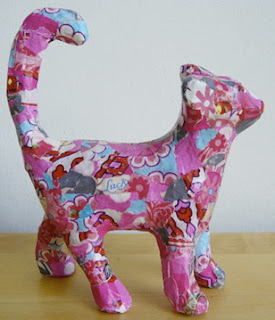 As the old saying goes, "There's more than one way to decoupage a cat."